How Far is Habitat Greens? Habitat Greens, you get more than just your share of the nature. While assuring your private space, this futuristic township project located off-Tumkur Road, also offers bliss beyond the 30 ft x 40 ft space that is yours. Habitat Greens is in close proximity to the court complex in the Jurisdictional area of Nelamangala planning authority, North Bangalore, one of the fastest growing corridors in Bangalore. Adjacent to hi-tech hospitals, international schools, colleges, highways and malls you are surely in a enviable neighborhood. A short thirty minutes drive from the heart of Bangalore city, it's a haven of your own amidst clean, blissful surroundings offering you the privacy you yearned for. 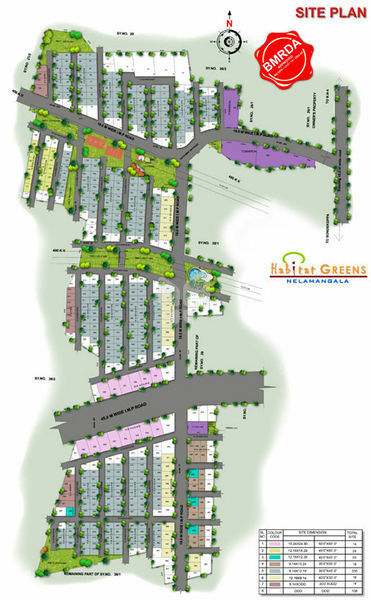 Habitat Greens offers 700 plus plots which would be developed in phases. Plot dimensions start at 1200 sq.ft and above. Needless to say, Habitat Greens is the one property you've been waiting for, whether as a safe investment or to live your dream life. National Highway 4 (Tumkur Road) - 0.7 kms. NICE Interchange @ Tumkur Road - 10.0 kms. Peenya - Dasarahalli Circle - 14.0 kms. BDA Outer Ring Road - 16.0 kms. Yeshwantpur Railway Station / Metro Station - 17.5 kms. City Railway Station / Bus Terminus - 23.0 kms. Habitat Ventures builds world class living spaces for people with a zest for life. A deep understanding of market needs, and individual aspirations combined with a breadth of technical knowledge has endowed the Group with the expertise to deliver exactly what the client wants, sometimes even outdoing industry benchmarks. The Illuminar one of the rising prestigious landmark by the builder which has really created a vibe among people to wait for the project which has promised to unload a load of amenities pelted with 2,2.5,3 BHK Apartments in Kengeri. One of the populous localities with high potential returns, people looking for properties to invest in realty this is the best project. Eden Heights an under-construction project by the builder being placed in a strategic location to fulfil all your daily needs within the gated community built with compact but spacious floor plans comprising of 2.5,3,3.5 BHK Apartments in Hoodi Main Road. The Aura a promised Pre-Launch by the builder rising in Hulimavu, Bannerghatta Road, an upcoming apartment project expected to be delivered by Dec 2020. Every project of Habitat Ventures is concluded harmoniously as it follows, from the start, a path of perfection blending quality, creativity, technology, aesthetics, sustainability and thoughtful amenities. Thus, even while enhancing functionality and value for money, these living spaces are a mark of elegance and grace. And thanks to the in-house expertise and the experience that the leadership has gained over the years in the areas of acquisition, conceptualization, architectural and interior design, construction management, marketing & property management, every time surpassing customer expectations has become a habit. This is the very reason why Habitat Venture has been consistently delivering state-of-the-art apartments and commercial projects in handpicked locations, thus reiterating its firm commitment to both clients and shareholders. To provide our clients & customers exemplary service in a professional & transparent environment & make the entire experience of dealing with the builder pleasant & personal.